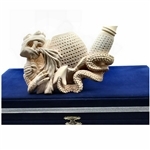 This section of Royal Meerschaum Pipes offers many unique collectible estate pipes. 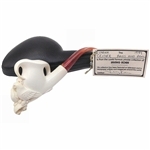 Some of these estate pipes are from the private collection of Irving Korn, founding father of Royal Meerschaum Pipes. Through the many years traveling to Turkey Irving handpicked and collected a variety of pipes that had special appeal to him. 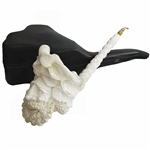 There are exceptional Ismet Bekler pipes from the days before Bekler became famous as well as very fine pipes from other carvers. 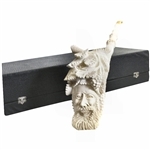 All the Meerschaum Pipes featured here are 100% Solid Block. Enjoy browsing and exploring the history and beauty of these very special older pipes. 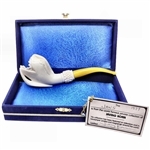 Jaws Meerschaum Estate Pipe is hand carved and inspired by the famous..